Trio Da Kali And Kronos Quartet's 'Ladilikan' Album Marry Two Worlds An unlikely musical collaboration, Trio Da Kali and Kronos Quartet shatter boundaries of culture, genre, faith and ethnicity. Trio da Kali and Kronos Quartet's album, Ladilikan, is available now. You might think traditional West African music and Western classical music would share little common ground. But Ladilikan, the album from Mali's Trio Da Kali and San Francisco's Kronos Quartet is a welcome landmark in the history of unlikely musical collaborations. The two groups together are a voice of an African praise singer harmonized by a string quartet. Trio Da Kali's members descend from venerable musical families in Mali. With centuries of history and musicianship at their backs, they represent the chamber music of West Africa. Hawa Diabaté, the group's vocalist, has been singing for decades, schooled at the foot of her world famous father, Kassé Mady Diabaté. Lassana Diabaté — no direct relation — is a monster balafon player who's worked with everyone from Taj Mahal to Béla Fleck to the top musicians of Mali. And the young Mamadou Kouyaté — whose dad, Bassekou Kouyaté, was nominated for a Grammy — holds down a solid, swinging bass on the traditional lute, known as a ngoni. Just these three musicians create such a big sound. Kronos Quartet is known for progressive and daring rule-breaking. Trio Da Kali, by contrast, is made up of staunch defenders of an ancient tradition: jeliya, the art of the griot. "Da Kali" means to keep a pledge, and the group's mission is to restore and renew their heritage in an era of rampant modernism and Islamic fundamentalism. Trio Da Kali and Kronos first performed together in a series of concerts some years before this album was recorded. So by the time they met in a Swiss recording studio, they knew exactly what to do. Central to everything is Hawa's luminous voice. So call this a happy marriage of pledge-keepers and rule-breakers. The trio holds fast to tradition, while the quartet soars into realms unknown. This mesmerizing album includes two songs adapted from Mahalia Jackson, who shares with Hawa a robust contralto voice. Think of it: a Muslim African praise singer channeling a late American gospel diva! 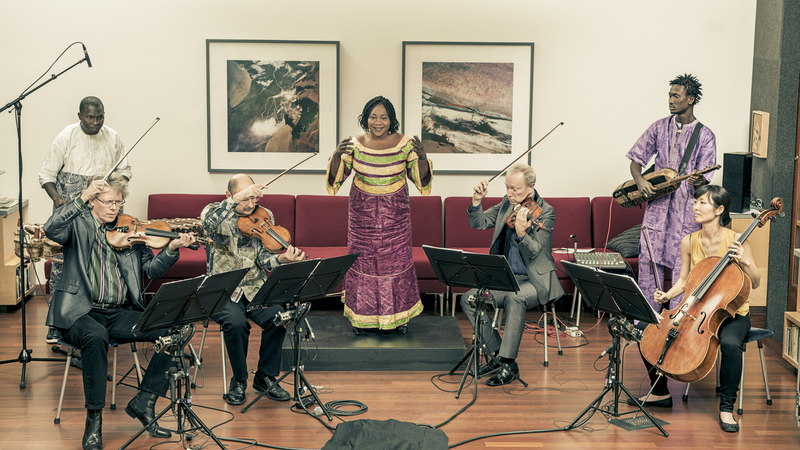 On Ladilikan, out now, Trio Da Kali and Kronos Quartet shatter boundaries of culture, genre, faith and ethnicity — all with an ease that must be heard to be believed.